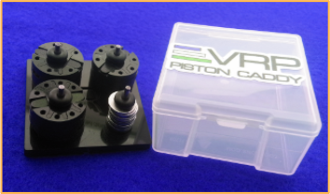 This is our new "Build Your Own" XV3 Piston Pro Pack. Now you are able to build your own Pro Pack with the pistons you prefer! We are also offeing this Pro Pack a little differently than in the past. You are basically purchasing two 2 sets of Pistons along with a Piston Caddy, and getting the 3rd set of Pistons FREE! Used by the Pros because they are Simple to understand! The Pistons are designed to increase the Rebound only. They do not change the compression from what you would have running stock pistons. No crazy set up changes. No scratching your head if they work or even made a difference. Anyone who has run them will tell you it was better from the moment they squeezed the trigger! No questions! ....Amazing!